Gary McGowan, David Apts, and Molly O’Bannion with the Premier Physical & Occupational Therapy staff. 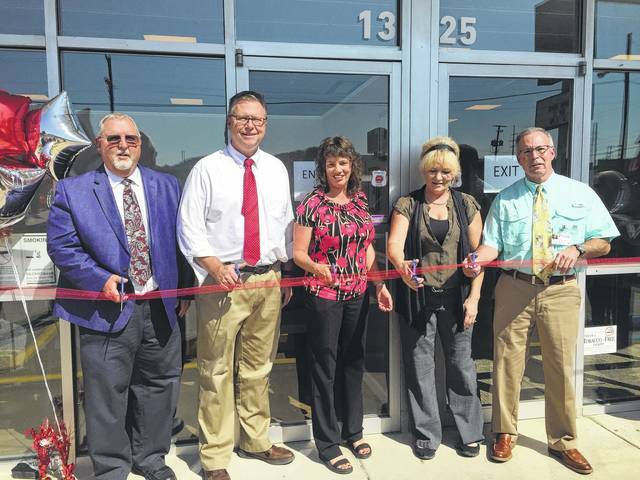 (Left to right) Gary McGowan, Ray Corriell, Molly O’Bannion, Kelly Moos, and David Apts cut the ceremonial ribbon. 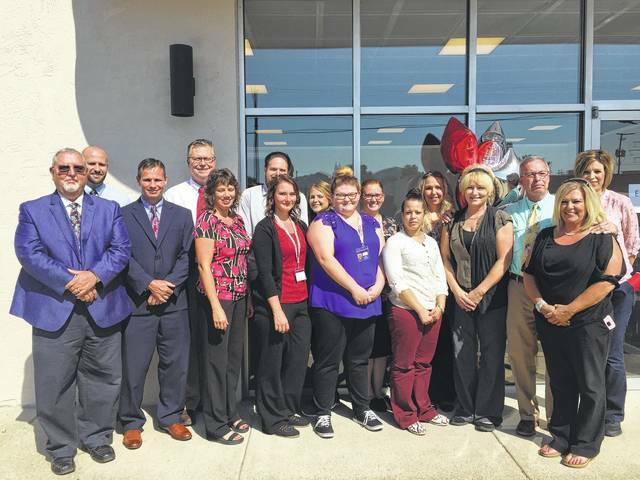 Wednesday, Sept. 27, Premier Physical & Occupational Therapy held a ribbon cutting ceremony at their new location on 11th Street in Portsmouth after opening the new facility last week. The Premier Company began in 1981 and serves patients through eight different clinic locations while striving to be the regions “Go To” physical therapy provider with five doctors of Physical Therapy, three Orthopedical Clinical Specialists, and a large team of therapists certified in the Primal Reflex Release Technique (PRRT) and Augmented Soft Tissue Mobilization (ASTYM). Premier has two Ashland clinics and additional clinics in Grayson, Wheelersburg, Bellefonte, Lucasville, and Proctorville, aside from the Portsmouth location. President David Apts believes the move to the new location brings with it better opportunities. Vice President Gary McGowan also believes the new facility is an overall upgrade from their previous Portsmouth location, where Premier had been located for the past 15 years. “Thanks to Molly O’Bannion of Exsell Reality Group, and Jason Stall of Stabo Construction we were able to relocate to this newer, modern location. The extra space will be better for both our patients and staff,” said McGowan. Premier Physical & Occupational Therapy operates with the promise to work every day to get you results quickly, prevent injuries through comprehensive physical training, lessen the severity of your injury, treat your injury quickly and effectively, and put all or their technology and skills to work for you immediately.